in lieu of an introduction letter i'd like to share with you this article i wrote titled "midsummer night's dreaming" which appeared in the a summer 1998 issue featuring fairy tidbits. these curious creatures, which are said to range in height from a weensy half inch to a towering six feet, and colors from gray to green to white, are pure enchantment! almost every culture holds some sort of legend or belief about them. many times they are associated with plants and garden lore. some of the herbs associated with fairies are st john's wort (protector of the little uncomforts naughty fairies do),and vervain,speedwell,eyebright,mallow,yarrow & self heal comprise the rest of the seven "fairy herbs". fox glove is often said to be a fairy plant (the juice of 10 will cure a fairy struck child), as are four leaf clovers(breaker of fairy spells) and mugwort. wouldn't it be grand to plant your own fairy garden with the listed plants or form a "fairy circle" with "pinks" (tiny little frilly flowers) as tasha tudor has been known to do? maybe you would like to create an indoor terrarium garden with delicate small plants and tiny rustic garden accents for your table top! 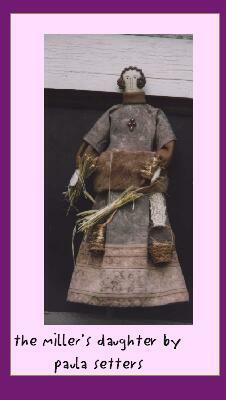 or- create a primitive fairy from some gossamer fabrics that you may have in the scrap box. here in cincinnati,OH the old greenhouse (as seen in country living gardener & herb companion) holds an annual fairy festival complete with a fairy garden contest and theater groups performing fairy stories. many such festivals take place about the country in the spring and summer months. the book worms section and spider web include lots of fairy goodies to get you inspired! 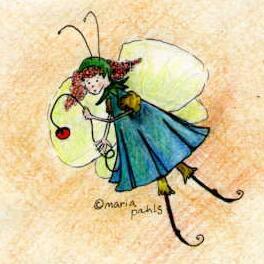 i'm lacing up my fairy boots now! "On Sat. I received my fairy tale swap doll from Sylvia. 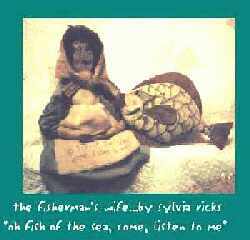 She is the Fisherman's Wife from the Brothers Grimm story of the same name. This large, long, doll wears a tiny blue check dress, apron, and a shawl cut from an old wool sweater. On her apron is stitched "Oh fish of the sea, come listen to me." Her face is hand stitched and painted with a very serious, primitive expression. Her name is Alice and she is the inspiration for the saying "..nags like a fish wife " (a saying I remember my grandfather using) And in her arms is a wonderful stuffed and painted muslin fish. He has white-fish scales, red lips, and a little dark blue on his body. His fins and tale are made of rusted tin that has been crinkled. What a treat! Sylvia is so talented. I hung a small chair on the wall and sat Alice down. Then positioned the fish on the wall below her so that they look at one another. I am very pleased with my new friends- cloth and flesh alike. I've enjoyed this swap a lot. Sylvia's style is so very, different from mine- that's what makes it so neat and special." "My gardens grow with treasures from garage sales, flea markets, thrift stores, or are home-made. The gardens here are definitely a work in progress. I love the vignette look, so I've created small gardens, each having it's own theme. The herb garden is full of tansy, yarrow, sage, lavender, thyme, lambs ears, etc. On one side sits the chair I bought that was missing it's seat. I added chicken wire, sphagnum moss, soil, and a birdhouse & created a chair garden. In front of the sage lies a lazy, cement rabbit that I painted to look ancient. A twig fence with a wood crow & herb sign hung on with rusty wire & tin star, holds back the tansy that's trying to take over the garden. There's a twig arch above that has clematis climbing up it. I plan to finish the walk-way with my hand-made stepping stones imprinted with leaves. The Americana garden is just getting started. There's an old, falling apart, wicker chair I painted dark blue with white stars, & some red, white & blue bird houses resting on the stumps of an old lilac bush trimmed long ago. I've added a white wicker basket with red geraniums & tiny blue flowers to the chair, & planted a small bush with white blooms. The flag that's painted on old wood, is sticking in the ground beside the chair. I'm planning to add a wooden uncle sam & lady liberty. Then there's the angel garden that began as an attempt to disguise a 4ft, tall tree stump that was backed up against the privacy fence. I had my husband build a big birdhouse to rest on the tree, & planted my garden all around it. I added a sm. section of twig fence, & planted purple cone flowers, sedum, feverfew, red barberry, artemesia & a holly bush. Then I decorated it with some cement angels, cherubs, & planters I got 'cheap' at a flea market & painted to look old. There's also the big wood garden angel with a rusty, wire halo that we built. The veggie garden is sort of being taken over by the sunflowers, morning glories, pumpkins, & gourds. There's a twig fence across the garden for the gourds to grow up, & a tall twig scarecrow with a rusty tin hat brim. AND... wind chimes... I've got a thing for the sounds they make throughout the gardens, so they are scattered about. I'm trying to decide where to place the rustic wood bench, & the 'seat' garden I made from the wood frame of an old footstool. I placed a bee skep in the center, planted sm. flowers all around it, & nailed a vine heart on to hang down the front. As soon as time permits, I'm sure I'll have another garden created for the placement of the extras. " seed pod note: drying also works for kumquats - tiny orange colored fruit that dry quite nicely- except don't cut into them. there are even small boxes (with a lid & a bottom) made of inside out dried orange skins that the outside was a golden white and the inside was a deep orange. as a bonus they had a most wonderful fragrance and seemed relatively durable. paula told me about a book which contains a similar project (see book wormies). the fruit is carved out and dried wood ashes are used to pull out the moisture. the top is fastened to the bottom of the fruit while drying to form a good fitting lid. ashes are changed regularly until the citrus is completely dry. once completed the boxes are sealed with a mixture of bees' wax and olive oil. it also tells how to turn the fruit inside out. ask for a schedule also books calendars & postcards with fairy themes. "are there faeries at the bottom of your garden?" "a wreath of christmas legends"
by Mary Elizabeth Johnson and Katherine Pearson. published in 1980 by Oxmore House. contains information about working with and drying citrus fruits as mentioned in tips & techniques. doll hair, and hand spun doll hai. And you and I will keep ourselves warm. Tints that spot the violet's petal." She stole the oranges, I do believe.